One of the more common obstacles in the inside sales industry is the lack of alignment with marketing departments. It’s unfortunate, because when these teams work together, they can create much higher brand awareness, generate more leads, and close more deals. No matter how good your sales team is, they’re leaving money on the table if they’re not consistently leveraging content in their process. The phrase “content is king” may be trite at this point, but that doesn’t make it any less true. The first place potential buyers search for solutions to their problem? Online. 81% of purchasers conduct research before even bringing a vendor in to discuss a project and also engage with an average of 10 pieces of information before making a final decision. If your marketing team is pumping out strong, SEO-optimized content on a regular basis, you’ll stand a far greater chance of being a part of the conversation. Not only does content drive more brand awareness, but it also educates potential customers about what you actually have to offer. Research shows that if a customer was introduced to educational content early on in the buying process, they were 131% more likely to make a purchase. Thought leadership in the form of industry blogs or whitepapers, along with case studies as proof points, help prospects better understand how they might benefit from working with you. To take advantage of this, sales managers should strategize content development with the marketing team, prioritizing the topics that customers are most interested in and answering the questions sales teams encounter on a regular basis. Content is also critical to supporting a growing inside sales technique – social selling – by building brand awareness on popular platforms such as LinkedIn and Twitter and helping sales pros initiate conversations, generate new leads, and build relationships. A study done by Feedback Systems indicated that 65% of businesses who implemented social selling experienced year-over-year sales growth, as opposed to 41% of those businesses that didn’t. We should expect more and more organizations to adopt this approach in the coming years in an effort to reach additional prospects. However, just because your inside sales pros are armed with this valuable content, that doesn’t mean they can use it however they want. There needs to be an informed and strategic content distribution plan to ensure maximum effectiveness. Top of Funnel: Attracting leads by educating and providing a general awareness of the solution offering. Middle of Funnel: Nurturing leads by giving a deeper explanation of solution benefits. Bottom of Funnel: Closing the deal after providing a trial or solution demonstration. If salespeople share the right type of content at each stage of the funnel, they’ll have a much better shot at influencing a purchase choice. And with the right mix of marketing technology, you can be extremely precise and distribute the right content to the right people at the time when it will have the greatest impact on their decision. At ServiceSource, our inside sales representatives constantly leverage our clients’ content across each stage of the sales funnel to help build relationships, facilitate conversations, and ultimately, close deals. It’s clear that inside sales teams can be vastly more productive when backed by a strong content marketing strategy. Then why do so many companies fall flat here, and how can they turn it around? The culprit? Communication. 49% of respondents in a study done by Demand Gen said that communicating effectively was the biggest challenge. This really shouldn’t come as a big surprise, since marketing and sales departments are prone to be being siloed from each other, especially at larger organizations. You need to understand that sales and content marketing alignment is a top priority and commit to supporting that; otherwise, you’re unnecessarily stunting sales and revenue growth. Set up a recurring meeting with managers from each side to promote regular communication and strategy alignment. Define the strengths, weaknesses, opportunities, and challenges that everyone is facing and brainstorm ways to improve in each of those areas. Clearly delineate each stage during the sales cycle and what type of content is needed at each point in the funnel. Implement communication services such as Jabber or Slack to promote real-time conversations and information sharing. Aligning your inside sales and marketing departments on content might feel painful at first, but tear off that band-aid – it’s absolutely worth it in the long run. 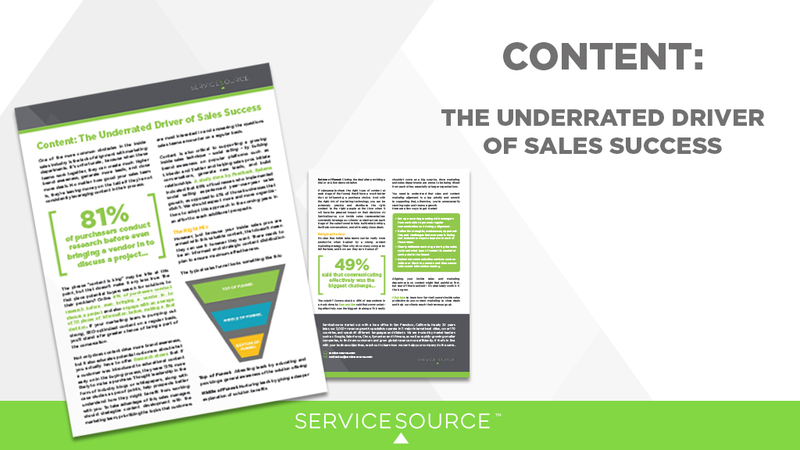 Learn how ServiceSource’s inside sales professionals use content marketing to close deals and help our clients reach their revenue goals.